SAM’s AGM will be held on 12th March at 7pm at the Museum. The formal agenda and reports will be circulated in advance of the 12th. All members are entitled to attend and vote and stand for the Committee. You can renew your membership or join on the evening. We have a number of vacancies on the Committee including needing a new secretary so we would welcome new members to help us continue to develop and improve the Museum. If you would like to stand, please let us know; call 01377 271180. Working in partnership with our friends at DIG in York, some of the most precious artefacts found around Southburn are on display in the new Your Dig exhibition which runs from 19th January until the 6th April 2018. Access to the SAM exhibition is free but the normal charges apply if you’re wanting to visit the excellent other DIG facilities. More information on Your DIG can be found by clicking here. DIG is located in the former St Saviour’s Church in St Savioursgate, York which is a Grade II* listed building maintained by the York Archaeological Trust. Click here to find out more about a recently discovered, and exceptionally rare, wooden henge found in East Yorkshire. Southburn Archaeological Museum celebrates its 10th anniversary in 2018. Please check back regularly as we will post updates of this year’s events. Click here to visit the Hull Daily Mail website with some exciting and interesting discoveries near to Burstwick. Andy and Lucy from BBC Radio Humberside solved the fiendishly difficult cryptic clue on the Absolutely Clueless to lead them to the Museum. You can listen again here and they reach the Museum at about 55 minutes. 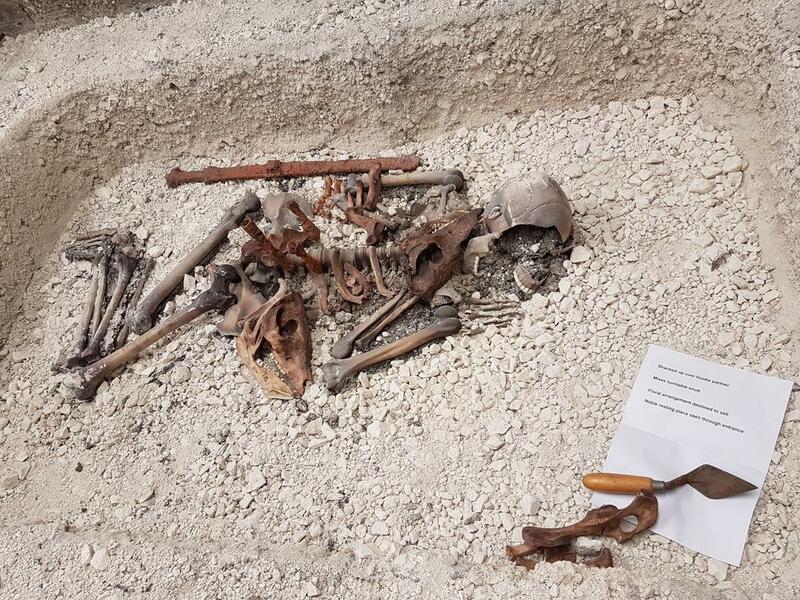 Lucy had to bit of excavating of her own to find the next clue…. “Swing low, sweet chariot, coming for to carry me home.” may be sung by the crowds at Twickenham but may soon be heard in our corner of East Yorkshire. The reconstruction of the Wetwang Chariot, a centre piece of the British Museum’s Celts exhibition (as seen below), could be returning to SAM at our new premises. Negotiations are at an early stage but it is an exciting possibility that the chariot could return to take its place in the very heartland of chariot burials in England.